Esther Ann Middlewood, born November 11, 1942, went home to Jesus on Sunday, June 17, 2018. She had a joyful reunion with her parents, George and Eva Middlewood; her brother, John and his wife, Malee; and her step-mother, Mary. Esther will be missed by those who remain on earth including her niece, Margaret (Stephen) Santos, their children, Dean and Aurora Lane; her daughter, Cathy Rafferty; and the rest of her family and friends. For more than 30 years Esther served in various positions with the Federal Government in Detroit, Arlington, VA, Lansing, and Grand Rapids; happily retiring in 2001. During her career, she enrolled in college and completed her BA at Spring Arbor College (University), with a hodgepodge of courses from Lansing Community College, the University of Maryland, and the University of Virginia. As a freelance writer/editor, Esther contributed articles and stories to numerous publications. 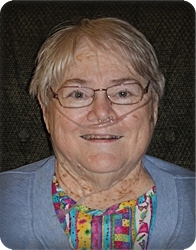 In 1995 she became editor of Old Mill News, an international magazine published by The Society for the Preservation of Old Mills, and served in that capacity for almost 12 years. Meanwhile, she wrote/edited several newsletters for non-profit organizations, including her church. Wanting to give back something to her community, Esther accepted an appointment to the City of Kentwood's Historic Preservation Commission where she served as chairperson. She also supported the Gaines Township Historical Society. An avid reader, Esther became a member of the Friends of the Library for both Kentwood and Gaines Township. When physical activities became increasingly difficult, Esther volunteered with Crossroads Prison Ministry where she reached out to hundreds of students during her time of service. A memorial Celebration will be held 11 am on Thursday, June 21 at New Hope Free Methodist Church, 5665 Eastern Ave. SE. with Pastor Garry Cruce officiating. Memorial contributions may be made to New Hope Free Methodist Church, 5665 Eastern Ave. SE, Kentwood, MI 49508, or to Crossroads Prison Ministry.